Timo Boll is one of Germany's best table tennis player and a former World Number 1. Timo Boll is one of the best players in the world. He's been ranked in the top 10 of the world rankings continuously since 2002 and is a former world number one ... having topped the list at the beginning of 2003 and again at the beginning of 2011 and 2018. 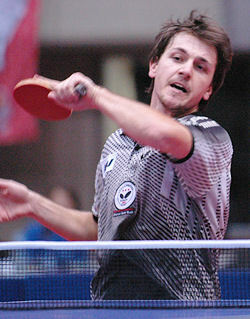 Born on 8 March 1981, Timo is now Germany's second ranked player. Well, with a long term sponsorship agreement with Butterfly, Timo Boll exclusively uses and recommends Butterfly table tennis equipment. In May 2007, Timo extended his sponsorship agreement with Butterfly until 2015, having first joined them in 1993. "The Butterfly company has always been my sponsor since I was a cadet and I have always been most satisfied with the agreement. We have a great deal of trust in each other. That's why I'm very happy to continue the agreement. I know that I have top quality equipment as a result of Butterfly's technology and know-how. This is absolutely essential for me to play at world level. It really helps my confidence." 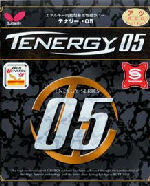 Since the ban on speed glue came into effect after the 2008 Olympic Games, Timo uses Tenergy 05 rubber with 2.1mm sponge. He's also changed from using the Timo Boll Spirit blade to the new Timo Boll Blade Series ALC. "Overall, the blade possesses a similar character to the Timo Boll Spirit, which I played before. As you can see, I'm handling my material really well". Timo's new equipment should also help him to maintain his current high world ranking. A table tennis player since the age of 4, Timo first broke into the top 100 of the world rankings at the end of 1998 and entered the top 10 in 2002 ... and he's stayed there ever since. By 1995 Timo Boll was already making a name for himself at the European Youth Championships where he won the Cadet singles, Cadet doubles and Cadet team titles. And in 1996 when he moved up to the juniors, he was runner-up in the Junior singles before winning the European Junior title in 1997 and 1998. Following his move up to the senior ranks, Timo Boll continued to progress, and he quickly became one of the top table tennis players in Europe ... and the World. The European Championships of 2002 saw him take the first of his Men's Singles titles before winning again in 2007 in Serbia, 2008 in Russia, 2010 in the Czech Republic, 2011 in Poland, 2012 in Denmark and 2018 in Spain. He also won the Men's Doubles title with his fellow Germans - Zoltan Fejer-Konnerth in 2002 and in 2007, 2008, 2009 and 2010 with Christian Suss. The Euro Top 12 ... an event which started in 1971 ... is for the top 12 ranked European players (or invitees). In 2015 it was extended to the top 16 players and became the Euro Top 16. With the ITTF Pro-Tour starting in 1996, Timo Boll has participated in these events every year, but it wasn't until 2001 that he had his first success ... when he took the Men's Singles title in Sao Paulo, Brazil. Additionally, he triumphed at the prestigious end of season ITTF Pro-Tour Grand Finals in 2005 in Fuzhou, China ... beating Belgium's Jean-Michel Saive to take the title. The table tennis World Cup is for 20 players only. Timo Boll has been part of this select group of professional table tennis players since 2002, and he's won the title on two occasions (in 2002 and 2005), whilst being a losing finalist in 2008, 2012, 2017 and 2018. Despite making it to the 2005 Men's Doubles final in Shanghai, China, Timo has so far been unable to secure a World Championship title. Although he's played in this competition since 1997, he hasn't managed to progress beyond the semi final stage of the Men's Singles. At the 2008 Olympic Games in Beijing, China, Germany's team of Timo Boll, Dimitrij Ovtcharov and Christian Suss took the Silver medal ... losing out to China in the Men's Team final. And at London 2012, Timo Boll, Dimitrij Ovtcharov and Bastian Steger won the Bronze medal, beating Hong Kong China in the Men's Team event. In 2016 at the Rio Olympic Games in Brazil, Timo Boll, Dimitrij Ovtcharov and Bastian Steger won the Bronze medal, beating South Korea in the Men's Team event. But unfortunately, despite taking part in 2000, 2004, 2008, 2012 and 2016, Timo hasn't managed to progress beyond the quarter final stages (in 2004) of the singles event. Timo Boll plays for german side Borussia Dusseldorf in the German Bundesliga, having moved from TTV Gonnern in 2007. Borussia Dusseldorf have won more Bundesliga titles than any other team ... are they're also supported by Butterfly ... and they won the European Champions League title in 2008/2009, 2009/2010 and 2010/2011. He speaks two languages - German and English - and is married to Rodelia Jakobi.